In this instalment of Where Are They Now?, Jamie Jowett catches up with one of the legends of Australian cycling, a man who made a mark as a rider, as a team director and now as a commentator and cycling administrator. It seems silly to ask about Scott’s whereabouts when we often see him on SBS, but there’s so much going on “behind the scenes” with Scott that we thought it was worth catching up to see where he’s at. First, let’s cover where Scott’s been and what he achieved as a rider (hint: plenty). But getting the ugly stuff out of the way, it’s fair to say that a nasty crash in the 1998 Amstel Gold Race (see video below) punctuated Scott’s career. But he worked hard to ensure it never defined him. On that day in 1998 Scott was near the front with 20km to go, looking at a top-10 finish. Then the crash happened. Scott’s rear wheel was clipped by the TVM car, driven by his former team manager Cees Priem who was looking sideways while handing a bidon out the window. Scott’s bike swung wildly across the road and he rag-dolled, still clipped in, bouncing two or three times on his head. Scott lay motionless in the foetal position and it wasn’t long before the medi-helicopter sped him to Maastricht Hospital. The Dutch emergency doctor concluded that Scott was only suffering from bad concussion, but Scott’s wife Sabine wasn’t so sure, refusing the suggestion that Scott be released from hospital. Sabine queried Scott’s blurred vision and the growing lump just underneath his skull. By now delirious with a massive headache, Scott could barely open his eyes. The next morning things were worse, and again Sabine refused to take Scott home. She arranged transport to Ghent, where the first CT scan was performed and the doctor operated immediately. Scott had suffered a double brain haemorrhage and a fractured skull. After a five-hour-long operation, three days in intensive care and two weeks in neuro-recovery, Scott was left to pick up the pieces of his career. His solid results afterwards came despite lingering disability from his crash, and it was his mental toughness to overcome this that helped him grow as a rider and a person. The aftermath shaped him as one of the most successful, empathic team managers, a weathered professional very much in touch with his staff and riders. Described as “the pros’ pro” by cyclingnews.com journalist Jeff Jones, Scott helped establish and steer teams to ultimate success, with Classics victories and a Tour win coming from his seat in the team car. Growing up one of seven kids in Inverell NSW, Scott dreamt of following his bike-racing father as he honed his skills at the local velodrome, aged seven. At 15 he headed down to Sydney where he became NSW champion on the road and in the ITT, and national pursuit champion on the track. Without an AIS system to support him, Scott left school at 17 and worked double shifts at the Bindaree Beef Abattoir to pay for petrol and race fees. Moving to Sydney a few years later to get ahead, he was still doing it solo as coaches and nutritionists with pro-cycling knowledge were few and far between. Without anyone to help him with his nutritional and training program, Scott won more state, national and Oceania titles than anyone could have imagined. At just 19 and still an amateur, he won the men’s elite road race at the nationals. Scott rode with GAN in 1997. Despite strong results, no offer came to join the AIS and be one of “Charlie Walsh’s boys”. Scott talks of this being another learning experience, “just because you’re not selected in the high performance teams, a racing career is still possible, on the condition you work damn hard on your own”. Heading to the US proved a confidence booster as Scott competed in races like the iconic Coors Classic, against a host of quality Europeans as well as the likes of Greg LeMond, Raúl Alcalá and Bernard Hinault. Shortly after coming home, in the Commonwealth Bank Classic, Stephen Hodge introduced Scott to his team director Jean-Pierre Mazza. In 1987 Scott headed to Switzerland with Mazza’s amateur team and was schooled in proper nutrition and training methods, in a team setup rivalling many professional ones at that time. With excellent results in Switzerland and Spain, Scott was signed by TVM in 1990 and raced the Tour Mèditerranean, Tour de Suisse and Giro d’Italia. The next year he followed the likes of Roger De Vlaeminck and Francesco Moser to win the Trofeo Pantalica, he came ninth at Tirreno-Adriatico, fourth in the Sun Tour and seventh in the Tour of Britain. TVM were seeing results from the promising Aussie. In the 1992 Milan-San Remo, Scott placed fifth ahead of Marco Pantani, Alex Zulle, Laurent Jalabert, Greg LeMond, Franco Ballerini, Marc Madiot, and Maurizio Fondriest. Just ahead, a valiant Moreno Argentin was beaten by the rampaging Sean Kelly in an epic MSR finish. Scott placed third in a Vuelta stage, and was awarded the Oppy Medal for Australia’s best cyclist later that year. Scott placed top 10 in five stages at La Vuelta, was top 10 at the Tour de Suisse in 1993 and Tour of Britain in 1994. He also placed in the top 20 at the Worlds in 1994. But his contract with TVM paid so poorly that he was forced to borrow money from his parents to move to Belgium, where he signed with Lotto in 1995. At Lotto Scott helped Andre Tchmil win Paris-Roubaix and Wilfried Nelissen win Omloop Het Volk, expertly keeping them out of the wind and bringing them to the front when required. Sunderland’s uncanny ability to do so in the Classics, meant he was very well respected by the whole team, even by unique characters like Gert-Jan Theunisse and Robert Millar. Scott in his Lotto days. In 1996, Scott raced his first Tour de France, finishing a hard-fought 101st after three weeks, capping it off with a 16th in the Tour of Luxembourg. Having virtually become a Belgian, Scott took first and second placings in stages of his “home race”, the Tour de la Région Wallonne. He even began sporting the slick look of the King of the Kermesse. His riding style mirrored his hairstyle — not always pretty but damn effective. Scott made the move to French team GAN in 1997 but then stared down an abyss. The technicolour vomit styling of the race jersey matched the team’s internal politics and instances of doping around him in the peloton. In that toxic environment, Scott says, he seriously contemplated walking away from the sport. He left GAN after just a year and saw a sports psychologist on the Gold Coast which helped to “switch his passion back on”. Heading back to Europe to join the small Belgian team Palmans, Scott learned from the best Belgian cobblestone specialists: the legendary Roger de Vlaeminck “a man known for his firm opinions” and Walter Plankeart, Ronde Van Vlaanderen winner and brother of Eddy, winner of both a RVV and Paris-Roubaix. Injured and with a very long rehab process to get through, Scott was unable to race for 1998 and most of 1999. Months later, doctors discovered a cracked vertebrae and damage behind one of his retinas. The lingering physical and mental scars are still with him today, not least the two dints in the back of his skull. On top of that, TVM chose to fight Scott’s insurance claim, forcing both Scott and Cees Priem to appear in court. Immediately after the crash Scott and his family struggled on, with his Palmans-Ideal team supporting him, while it seemed TVM were intent on running him over once again. Unbelievably, the court case is still ongoing … 15 years later. Returning to racing in late 1999, Scott secured a valuable victory in La Vuelta Castilla-Lèon, a win as important to his mental state as it was to his team’s ranking. Scott then set his sights on a big year ahead with the nationals, Olympics and world championships in 2000. Scott attacks the cobbles of the 2000 Omloop Het Volk while riding for the Palmans squad. Scott assumed that being the second-placed Australian at the nationals in 2000 would guarantee him a spot on the Olympic team. Unfortunately Australia’s best one-day rider was not picked and the injustice still burns today. Robbie McEwen came 19th in the Olympic road race, best placed of the three Aussies who finished. Less than a month later, Scott finished seventh at the worlds in France. In 2001 Scott returned to the Amstel Gold Race with his new Danish team Fakta, but memories of his crash, coupled with rain and constant crashes, brought on a near paranoia. He burned too much valuable energy, but still finished a very credible 18th. It was a strong year for Scott, with good results for his small team. He finished 23rd in the 2003 Giro d’Italia, helping teammate Magnus Backstedt to fourth in the points competition and the Inter-Giro jersey overall, as well as a stage win to Kurt Asle Arvesen. 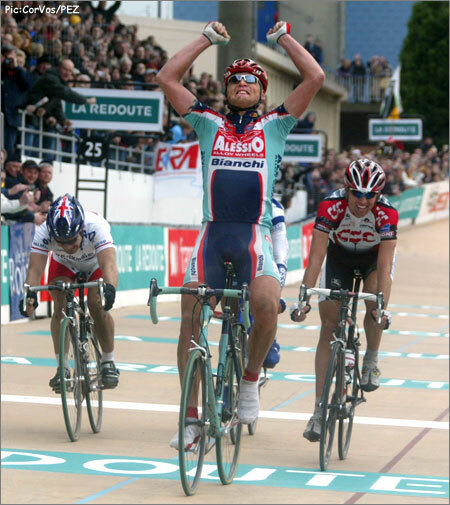 Joining Alessio Bianchi in 2004, Scott rates Paris-Roubaix as his most satisfying race that year. Not for the sheer satisfaction of completion, but for the big part he played in Magnus Backstedt’s victory. Sunderland smiles as he recounts being the “Poisson Pilote” (“pilot fish”), riding Big Maggie on his wheel up through the field and avoiding disaster on the hellish cobblestones. Scott was a “good driver in heavy traffic”, dropping Backstedt off to join a select bunch at the crucial moment in the race. The big friendly Swede powered away in the velodrome to win and, not for the first or last time, a Paris-Roubaix win had Scott Sunderland’s fingerprints all over it. Scott (second from right) with his Alessio Bianchi team in 2004. Magnus Backstedt is third from the right. The lingering effects of his crash meant that Scott was suffering more and more from back problems, causing a lack of power, and made worse in the cold. Scott’s 96th in the 2004 Tour de France was a long way behind the “winner” Lance Armstrong. Riders he had soundly beaten as an amateur now somehow appeared superhuman. While he fatigued, those guys got stronger. He laughs about it, but I know he’s exasperated as he recalls a sprinter passing him up a big climb in the third week of a Grand Tour. Scott says he enjoyed the races that season, mainly because he knew they were his last and he was able to motivate his teammates. But his days racing a bike were ending. At the 2004 Tour Bjarne Riis approached Scott to join his new team CSC. The intention was for Scott to win them a Classic and pass on his vast experience as a rider. By this time though, Scott’s body was screaming to stop, and he convinced Riis to give him a DS role instead. Alongside good friend Kim Andersen, they scored a record number of UCI victories that first year, podium places in all Grand Tours, and Carlos Sastre’s 2008 Tour de France win. Scott sits with Bjarne Riis during the 2007 Tour Down Under. For years as a rider, Scott had expertly prepared, trained and managed himself. He had developed an innate knowledge of the races from many years as a super domestique. For the Spring Classics especially, Scott’s advice is simple: “If you’re not up the front when the crosswinds hit, or at the start of a climb or cobbles when the action starts, you may as well hop in the car and grab a shower”. Scott worked with Riis to establish a Classics squad within CSC, assembling the whole support crew to train as a unit months before. As a grand tour specialist, Riis happily delegated to Scott, who brought his meticulous planning and preparation, and ability to provide cool and decisive instructions. In a race, Scott made sure every rider knew what was coming up, and when he said “go”, they went. In the team meeting the night before the 2008 Milan-San Remo, Scott laid out a simple decisive plan — Franck Schleck would ride tempo for Cancellara on the Cipressa and Poggio, allowing Cancellara to make his break. To plan, Cancellara won convincingly. Scott’s strategies also helped CSC win successive editions of Paris-Roubaix in 2006 and 2007, with Cancellara and O’Grady respectively. Deflecting this success, Scott points to Riis trusting in his managers and his immaculate team set-up and support, and of course the quality of riders they had to deliver those results. As a measure of the lengths he would go to to ensure success, Scott wanted to test the Zipp, Cervelo and Vittoria kit in race conditions. Taking the whole squad out to train in the Arenberg Forest, his riders smashed $30,000 of wheels within the first 20 minutes, sending the techies scurrying back to the drawing board. Scott with Kim Andersen and Jens Voigt at the 2008 Tour de France team presentations. In 2008, British Cycling High Performance Director David Brailsford was establishing a new British road team. As a track team, they raced in homogenised environments, air-conditioned velodromes with standardised track dimensions. The vagaries and logistical dimensions of road racing must have sent Brailsford into absolute meltdown. Here was a guy perceived to want absolute control over every detail, who would think micro-management is utter laziness. Hiring Scott Sunderland was a master stroke, not a marginal gain. After a winless start, Chris Sutton broke the team drought with Sky’s first UCI Pro Tour race in the 2010 TDU and shortly thereafter Flecha won Omloop Het Volk. The plans Brailsford and Scott had put together were now delivering results. Sunderland left in May 2010, seeking a stable life for his family back in Australia and for the health needs of his youngest son in particular, who suffers from liver fibrosis. Scott won’t be drawn on it, but I am inclined to think Scott was frustrated by Brailsford’s rumoured dominant management style and apparent capacity for self-absorption. Nevertheless, when Sunderland left, Brailsford said, “Scott helped us get from the drawing board to being a real road team, working with us from the announcement of the project to our first podium finishes”. Scott enjoyed working with Brad Wiggins but recalls a complex, reclusive character, needing his space and his own people around him. Scott also talks positively about working with Richie Porte, seeing similarities to his own rise into racing and having genuine respect for Richie’s hunger and understanding of good preparation. Scott with Fabian Cancellara during the 2010 Tour of Qatar. Scott was engaged by the UCI in 2011 to establish and run a Directeur Sportif licensing and accreditation course for Pro Tour and Continental teams, with Scott lecturing in French and English. Scott is now working with CA to establish their own version of the course. Through his company Scott Sunderland Sports Management, Scott also works with corporate and young professional riders, training camps and programmes, helping direct younger riders the way he once had to do all alone. Scott also now leads corporate tours at Le Tour for Cycling Australia. And, of course, Scott does expert commentary work with SBS TV, particularly during the Tour de France. This is clearly a great opportunity and a great initiative for all involved, especially young Aussie riders. Ever the super domestique, Scott has found yet another way to help those around him get ahead.